Gorgeous Beach Condominium with excellent designer decor throughout and 40' LCD Samsung TV in the living room area. This unit is not your typical beach apartment. See pictures for spectacular interior accommodations and great art work. Close to grocery store, beverage distributor, pharmacy, shopping malls, restaurants, night clubs, Casinos, money exchange, banks, gas stations. Whether you need a romantic getaway or just a place to lay back and relax you mind and soul. This relaxing Caribbean get away can be yours. Stanza Mare is the perfect location to enjoy coconut trees and white sandy beaches and a warm crystal water all right outside your door. Activites and Attractions:: Enjoy an array of water sports, cafe, restaurants offered right on the beach is absolutely amazing. Swimming with SHARKS & Dolphins, SCUBA, Reef & WRECK SCUBA Diving, Snorkeling, Para Sailing, Kite Surfing, Sail Surfing, Catamaran rentals, 4x4 ATV Tours, River Rafting, Glass Bottom Boats, Deep Sea Charter Fishing, Flying Boat rides, Speed boats, Sail Boating, Banana boating, kayaking, Double Decker Party boats, Sunset Dining Cruises, Boat Taxis that take you from one hotel to another via the beach. There is also a brand new Manatee Park with 130 meter preserve with permanent exhibits of birds, reptiles, and fish and much more. There is also horseback riding, helicopter rides along the beach and much , much more. Our Condominium at Stanza Mare is located just minutes away from all the best that this beautiful Paradise has to offer. Casinos, Restaurants, Great Shopping, Night Clubs, Movie Theatre and restaurants like Tony Romas, Hard Rock Cafe and Sushi bars come and enjoy this paradise. I can be reach on my cell phone, 305-905-8474 or E mail. gsanti@ail.com I am the owner and I will do anything that I can to Ensure your stay in my condo will be a pleasant experience. Bavaro Beach water tempeture 87 degrees year around, quite condo, large, gorgeous pool. And friendly staff. On the beach, within walking distance from restaurant, grocery stores, pharmacy and 20 minutes From Punta Cana Airport. If you want a beautiful condo, this is the place ! My husband and I stay at that condo during 6 months every year for the past 4 years. This condo is very clean and pretty well maintained, really nicely furnished, stocked with plenty of towels and beach towels and has everything you need to do your own cooking. Within a short walking distance (10 min) are small supermarkets, fruits and vegetables stands, and restaurants with a good selection of foods for very reasonable prices. Interesting to see all the comings/goings of the local people. We are a few steps from the beach. The owners are nice, professional, communicative and responsive. Thank you Miriam and Guillermo for treating us like family. We definitely will return next Winter again. GORGEOUS CONDO, STEPS AWAY FROM THE POOL & BEACH! The condo was just our home away from home, we traveled with teens, which spent most time in the pool just a few feet away from the back door, for me and hubby the beach was awesome, a short walk from the condo as well. We enjoyed every minute, as we traveled to Boca Chica and Puerto Plata, we couldn't have done that buying a complete package at Punta Cana. Two bathrooms to accommodate 4 guests, full kitchen with all the seasonings to make your meals taste great + a line of excellent restaurants all nearby. I highly recommend this condo, if you want to live a truly beach experience in Bavaro Punta Cana. ps. Guillermo and Miriam were excellent owners' , they help us with all our traveling and settling issues, they provided a guideline in what to do and NOT TO DO in Punta Cana! I really followed all his suggestions, and they recommended two nice ladies, Anna which welcome us to DR. and Belkis to help us in the condo with the home chores! It worked very well, it was a complete new experience for us. The Stanza Mare complex has a very clean and safe environment, right on the beach. The entire complex and garden area are very well maintained and we feel in total security with security guards 24/7 on the site. All the current employees are very helpful and friendly, especially Carlos, the security guard on the beach who takes care of us. Our stay at that condo is enjoyable and the most relaxing vacation we have ever had. Most importantly is the fact that the Condo owner is very honest and easy to deal with because he is very helpful and quickly replies to any questions we have. Everything he told us about the place is as he described it. The condo is very well kept and very warmly decorated. We saw other condos in the complex and this one is by far the nicest one. We have a wired High speed internet and telephone service inside the condo. The swimming pool has been newly remodeled and close to our unit. The grounds are very well maintained and fumigated twice a week. For the shade on the beach and pool, there are several palapas and parasols with many long beach chairs with cousins. We walk for miles on the beach in both directions and the beach in front of the complex is one of the nicest. At a walking distance on the street, there are many good restaurants (Thaïn/asian, italian, mediterranean, french and 3 beach restaurants/bars within a 2 minute walk on the beach. The 3 grocery stores, the fresh fruits & vegetable market, the bakery and the pharmacy are at a walking distance from the complex for our basic needs but for larger shopping or groceries, we have choice to go to 2 shopping centre within a 20-30 minutes by local bus ride for 30 pesos ($0.75) each and come back in taxi for 500 pesos ($12.50). We absolutely love this condo and appreciate how close everything is. Following our previous review, we would like to clarify the subjet concerning the internet service that we mentionned last year in our comments as the internet service on the site was the only negative point. When this point has been addressed to our owner, he decided to install a wired High speed internet and telephone service in his condo and that, although the WI-FI internet in the common area has been improved to have a signal now much better than last year. We can say that this condo is the envy of several people this winter and we certainly do not hesitate to recommend this condo to anyone. Un condo 5 étoiles pour un séjour 5 étoiles ! Nous sommes bien placés pour pouvoir donner l’heure juste maintenant puisque nous avons loué le condo de Mr. Santiago pendant 6 mois et nous avons tellement aimé notre séjour ici que nous avons décidé d’y revenir pour un autre 6 mois en oct. prochain. Nous avons visité plusieurs condos ici dans le complexe et nous pouvons affirmer que celui-ci est l’un des plus beaux, propres, confortables et des mieux décorés et équipés. La cuisine est très bien équipée (gros réfrigérateur, cuisinière au gaz avec four, cafetière, micro-ondes, grille-pain, mélangeur élect., presto, friteuse, bons chaudrons de grande qualité, très belle vaisselle, etc). En plus de l’A/C au salon et dans la CAC, et la TV écran plat de 40’’ au salon, il y a un séchoir, une TV et un déshumidificateur dans la CAC et toute la lingerie et literie nécessaires sont fournies. Nous pouvons affirmer que ce condo a fait l’envie de plusieurs personnes cet hiver. Nous avons été très chanceux de pouvoir faire affaires directement avec Mr. Santiago, il est très honnête et voit vraiment à ses affaires, il peut être rejoint en tout temps, retourne nos appels rapidement et répond à nos questions immédiatement. Une nouvelle gestion a été mise en place depuis un mois maintenant et nous pouvons déjà constater de gros changements qui s’avèrent être pour le mieux. Une toute nouvelle salle de lavage vient d’être aménagée dans le complexe, avec service complet ce qui nous permet d'aller se prélasser sur la plage pendant que la préposée est en train de faire notre lessive. La nouvelle équipe du Resto/Bar Stanza Mare qui est très dynamique, met de la vie sur le site et apporte une belle ambiance autour de la piscine et au resto/bar qui offre un menu très varié et à des prix très abordables. Le complexe est situé directement sur la plage de sable blanc (exactement ce que le proprio nous avait dit). L’ensemble du complexe ainsi que les jardins et la piscine (50' de notre condo) sont très bien entretenus. Tous les gens qui travaillent pour le Stanza Mare présentement sont très serviables, aimables et chaleureux. Bravo à la nouvelle équipe de gestion, nous sommes certains que nous constaterons encore d’autres améliorations à notre retour l’automne prochain! Nous n’hésitons certainement pas à recommander ce condo (K-101) à quiconque désire passer des vacances mémorables dans un beau condo très moderne et confortable, à distance de marche de tout ce qui est nécessaire pour passer un agréable séjour ! A 5 stars condo for a 5 stars vacation ! We are well placed to give the right time now since we rented that condo for 6 months (Oct.15-April 14) and we loved so much our stay here that we decided to come back for another 6 months in October. We visited several condos here in the complex Stanza Mare and we can say that it is one of the most beautiful condo, very clean, comfortable and one of the better decorated and equipped. The kitchen is very well equipped (large fridge, stove gas oven, coffee maker, microwave, toaster, blender, presto, fryer, good pots of high-quality, beautiful dishes...). In addition to the air conditioning in the living room and the bedroom, there is a 40’’flat screen TV in the living room, and a small TV and a dehumidifier in the bedroom. All the linen and bedding are provided. We can say that this condo made the envy of many people this winter. We have been very fortunate to be able to do business directly with the owner, he is very honest and sees to everything, he can be reached at any time, returns our calls quickly, and answers our questions immediately. A new management has been put in place recently at SM and we can already see the changes that are for the best. A brand new laundry room has been built in the complex, with full service, allowing us to spend time on the beach while the clerk is doing our laundry. The new team of the Resto/Bar SM is very dynamic, puts life on the site and provides a nice atmosphere around the pool and the resto which offers a very varied menu at really affordable prices. Bravo to the new management team, we are certain that we will see still further improvements to our return next fall ! The only negative point is that there is no internet or telephone nowhere on the site (including the condo)... need to go to the accomodation store to use their WiFi internet. The complex is located directly on the white sand beach (exactly what the owner told us). The entire complex, gardens and the swimming pool (closed by our condo) are very well maintained and we feel in total security with security guards 24/7 on the site. All the people who work for the SM currently are very helpful and friendly, especially Carlos, the security guard on the beach who takes care of you by placing chairs where ever you want. We do certainly not hesitate to recommend this condo to anyone who wishes to spend memorable holidays in a beautiful condo, modern and comfortable, in walking distance of everything what is needed for a pleasant stay ! Located in the beautiful 'Los Corales' ocean front community area in Punta Cana/Bavaro. Stanza Mare condominium happens to be situated on one of the TOP 10 beaches in the world....'Playa El Cortecito and Playa Bavaro!!!! Whatever you need is right at your fingertips in this Prime location near everything you might need or want to do while vacationing. You need to go no further than Stanza Mare for your dream vacation. Stanza Mare has the quality and demands of a four star hotel in front of the most beautiful beach in the world and in the most visited tourist destination in all the Caribbean. Golf: A favorite GOLFING destination of former Presidents Bill Clinton and George H. Bush, the Dominican Republic has become one of the hottest spots to tee off in the Caribbean, if not the world. Here golfers will find 19 courses with Ocean front fairways, and dogleg lefts around swaying coconut palms. They 'll also find courses designated by legends such as Pete Dye, P.B. Dye, Jack Nicklaus, Arnold Palmer, Robert Trent Jones, Gary Player, Tom Fazio and Nick Faldo. Golfing by Jack Nicklaus at Punta Espada Golf Club, the first three Jack Nicklaus Signature Golf Courses in Cap Cana is operated by Troon Golf and opened for play in November of 2006. The par 72 course incorporated the surrounding natural beauty of Cap Cana, stretching along a coastline where golfers on each hole look out into the blue expanse of the Caribbean Sea. There are numerous golf courses in close proximity of Stanza Mare: El Golf de Bavaro 18 holes par 72 (Barcelo hotels), Cocotal 27 holes par 72 (Melia hotels), Punta Cana Golf ( Club Med, Punta Cana Resort & Club, Cabeza de Toro Golf (Catalonia Resort). 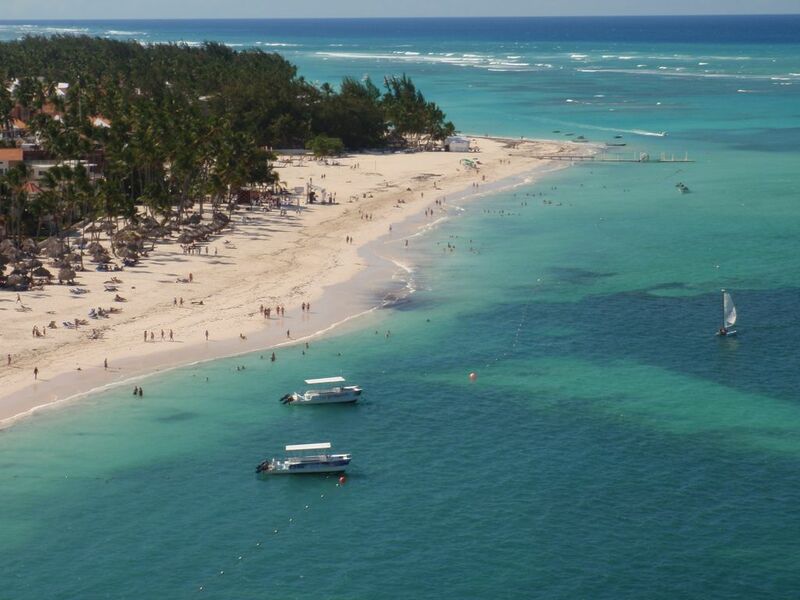 White Sands Golf (Blue Ocean Resort), Punta Espada (Cap Cana).